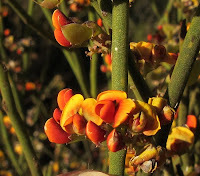 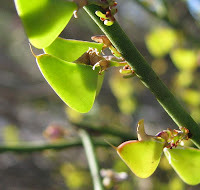 Plants in the genus Daviesia are known as Bitter-peas as anyone who has crewed a leaf would know, they are members of the exceptionally large Fabaceae family, which now includes all legumes. 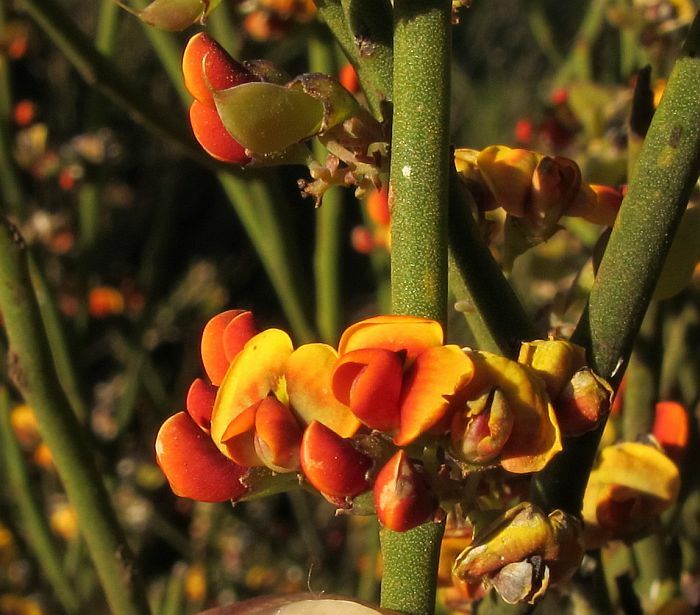 Daviesia benthamii is a highly variable species occurring in WA and SA and has been known by many names, but Dr. M D Crisp’s ‘Contributions Towards a Revision of Daviesia. 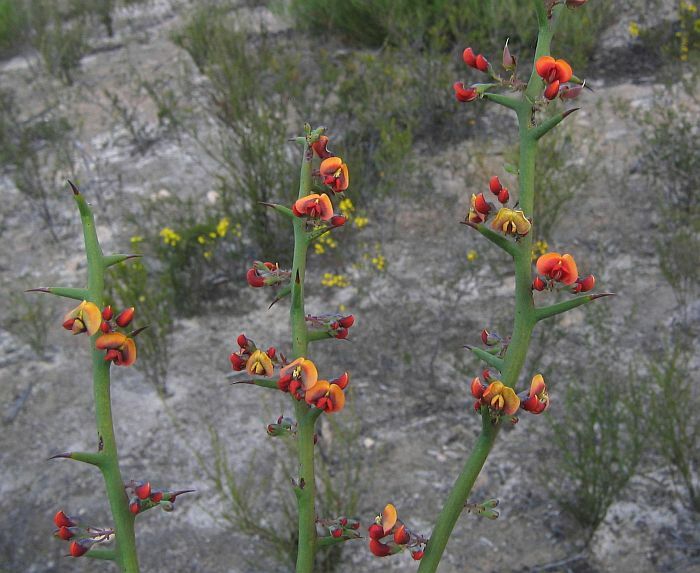 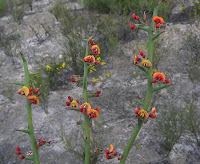 A Synopsis of the Genus’ (1995), refined these variations to 3 subspecies of which 2 occur in WA and the Esperance region. .
Daviesia benthamii subsp. 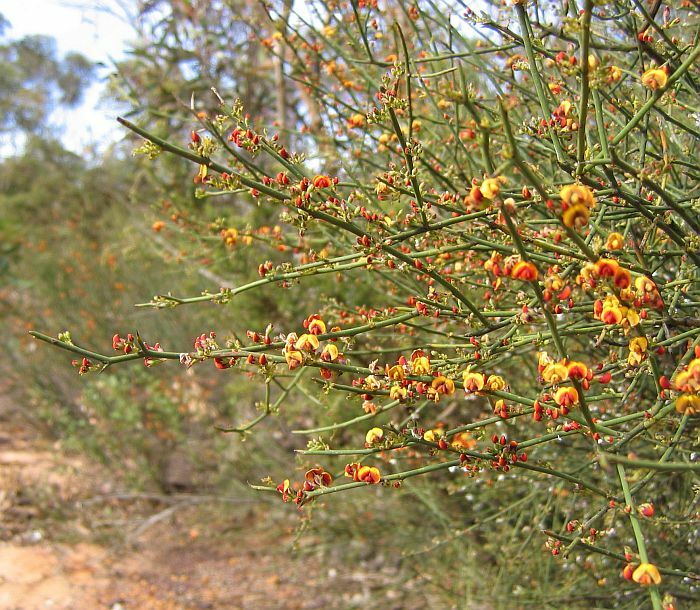 acanthoclona is the most common in the Esperance district, but overall is found (mostly inland) from Bremer Bay (west of Esperance) to Geraldton, then via Kalgoorlie to Israelite Bay (east of Esperance), where it favours sandy soils overlying clay, gravel or limestone. 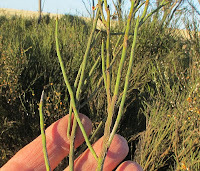 This subspecies differs from the other two, by the spiky phyllodes being to only 1 cm (3/8”) in length, which are restricted to the upper portion of the branchlets, or (less commonly) no spines at all. The other local species, subspecies benthamii has only a few records to the northeast and far western portion of the Esperance region (although common elsewhere including SA), it has spiky phyllodes over 1 cm and often several centimetres in length, which are confined to the upper two thirds of the branchlets. 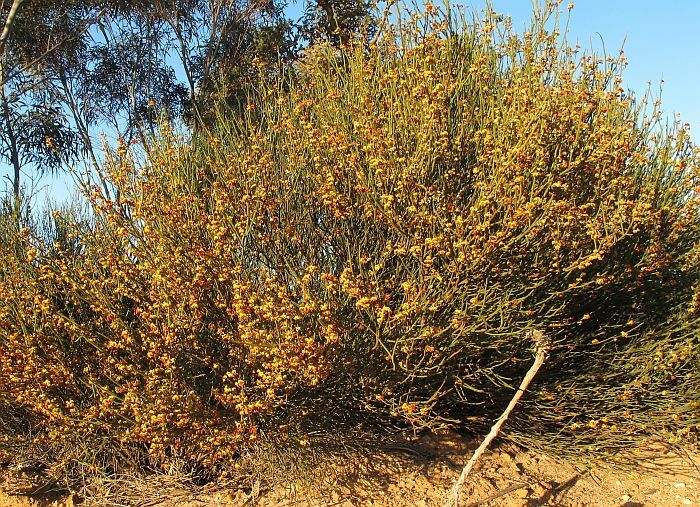 Subspecies humilis only occurs in SA and is much shorter (to 60 cm or 2’ in height), plus has spiky phyllodes over the entire length of the branch. 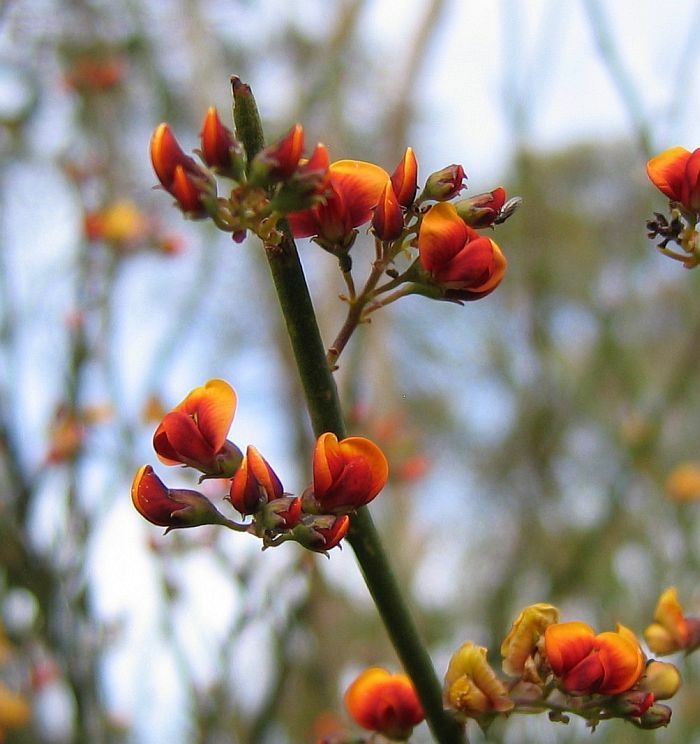 Both local Daviesia benthamii subspecies can grow to around 2 metres (over 6’), but are usually closer to half that height; they are often widely spreading and commonly occur in small thickets. Despite their largely leafless appearance, they can be quite bushy and difficult to handle without their sharp spines drawing blood. Daviesia benthamii subsp. 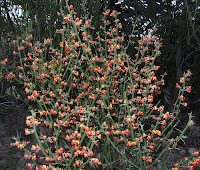 acanthoclona nevertheless is very showy when in bloom, with many racemes each producing several bright red/yellow flowers. 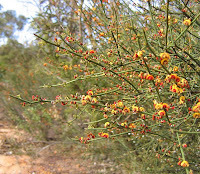 The pods of Daviesia plants are highly distinctive by being triangular in shape, and can be ornamental in their own right. 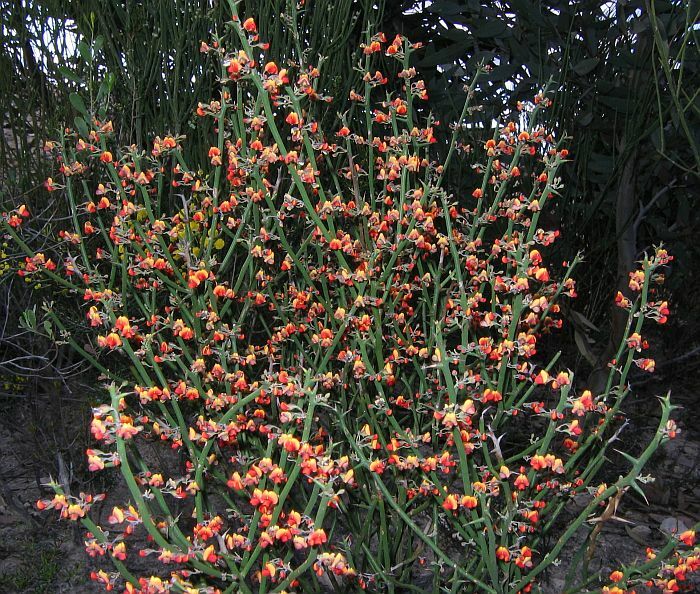 The flowers are produced anytime from August to November during/after good seasonal rainfall and the advent of warm weather.